It doesn't take much to get a bunch of 5 year olds excited about interactive games, but a new app called ScratchJr is not just a game – it's a learning tool as well. ScratchJr is essentially a coding language for kids, ages 5-7, which allows them to program their own interactive stories and games. Developed by a team at Tufts, the MIT media lab and Playful Invention Company, the ScratchJr app is designed specifically for a young child's cognitive, personal, social, and emotional development. Marina Bers, the director of Tufts' Development Technologies Research Group, says by learning how to program, children are also learning how to express themselves. 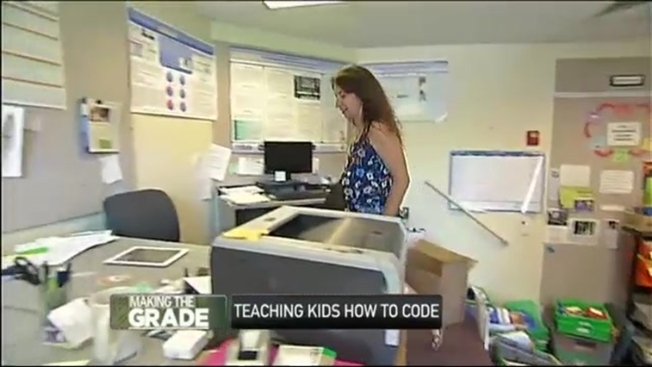 "Programming is about creating a sequence of commands in a systematic way, so it's really about abstraction and helping you think in systematic ways and problem solving in systematic ways," she said. To program the app, kids snap together blocks to make characters move. They can add their own voices and sounds and even insert photos of themselves to customize their characters. "It has to be developmentally appropriate because these children may or may not be able to read and write, so you have to have icons that they easily understand," Bers said. Learning to program before learning to read and write is becoming common for young children in this interactive age.